Known as Brazil's financial hub, the city is also becoming famous for its massive Carnival bloco parades, attracting almost four million people over the weekend. SÃO PAULO, BRAZIL – Known as the financial heart of Brazil, the city of São Paulo has put aside its business-like demeanor to welcome Carnival in grand style, and may soon compete with Rio de Janeiro and Salvador for capturing the world’s attention of the celebration. More than one million people attended the Academicos do Baixo Augusta bloco parade on Sunday, photo internet reproduction. Over the last few years, the city, home to over twelve million people, has also become a very popular city to enjoy the five days of festivities, and if this past weekend is any indication the city will host one of its best Carnivals this year. “In the past few years I’ve gone to Rio to ‘experience’ the street Carnival blocos,” Mariana Ferreira told The Rio Times. “But this is so great, that this year I won’t have to leave my city or see it all only via television. São Paulo is really putting on a great Carnival!” added the 32-year-old sales clerk on Sunday while dancing and following the Academicos do Baixo Augusta. With the motto “It is Forbidden to Forbid”, the Academicos do Baixo Augusta attracted a crowd of one million party-goers to the central streets of the capital. This year the bloco protested against censorship, inequality, racism, chauvinism and injustice. Due to the surge in the number of blocos, city officials imposed a series of rules and regulations this year to allow the groups to hold their parades. “The more you try to forbid us, the more there will be carnival. The more the idea of order is synonymous with censorship and dictatorship, the more we will celebrate the beautiful disorder of Carnival,” read the manifesto distributed by organizers. 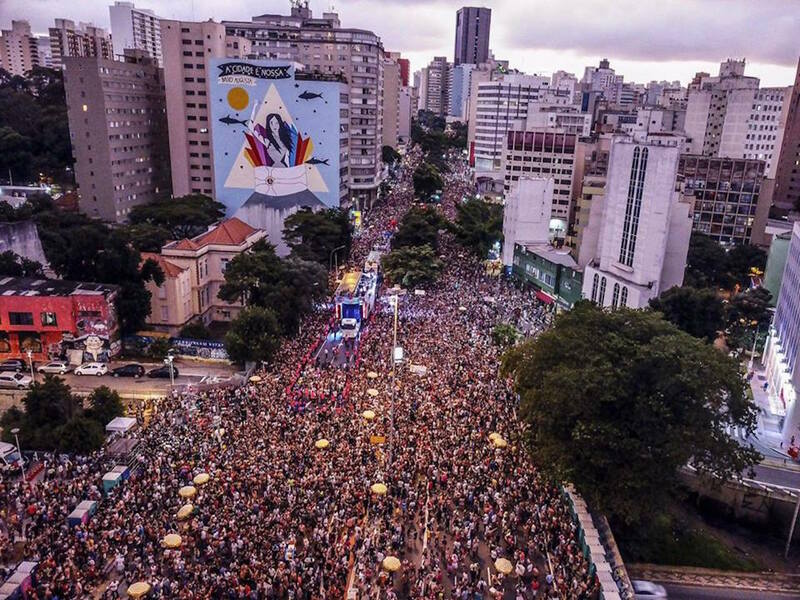 According to city officials the pre-Carnival ‘blocos’ in São Paulo brought together 3.95 million people this past Saturday and Sunday (February 3rd and 4th) who attended 187 parades throughout the city. From February 3rd to 18th 491 blocos will hold parades in the city. To make sure party-goers have proper infrastructure, the city has made available 21,000 chemical bathrooms per day during the weekends. This year, to do away with the foul smell left behind after the parade passes, there will be a R$500 fine for those caught urinating in public streets. In addition, 200 cameras and dozens of drones will be monitoring streets and parks where the parades are scheduled. The city has also 730 ambulances per day ready for emergencies, and has set up 480 Intensive Care Units (mobile ICUs) and 80 medical stations to assist party-goers.